For getting soft and smooth skin, everyone should be scrubbing their skin to remove died cell. You can use homemade scrub or any brand scrub cream which is available in market. 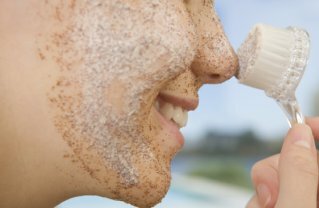 Homemade scrubbing pack is cheaper than market product and all ingredients are available in your kitchen cupboard.So, if you want to get healthy and smooth skin, try below homemade scrub recipes which will leave your skin hydrated and refreshed. Mix 2 mashed strawberries,1 tsp almond oil and 3 tsp granulated sugar together very well, make it thick paste. And massage this scrub on your face, neck and dry skin area by using your figure tips as circular motion. Leave it sometime and risen off with warm water. You will have soft and glowing skin. Almond oil is good moisturizing oil for dry skin; it will help to keep your skin smooth and soft. Make a paste of 2 tsp of find oatmeal, 2tsp plain yogurt,1 tsp almond oil and leave it 5 minutes for soften oatmeal. Rub this scrub lightly on face and neck avoiding eye area. Continue to massage for about 5 minutes after that wash it with warm water. Cornmeal is a great scrub for oily skin. Combine 2 tsp cornmeal with 1 tsp lemon juice and 2 tsp of yogurt or curd, make it thick paste. Then massage it into the face for about 5 minutes and rinse off with tepid water. Hi! I am Surendra when my body getting old because of wrinkles then I have decided to best wrinkle removal clinic in Delhi. By anyone I heard about in klinikesthetika clinic that was very famous for Wrinkle Reduction in Delhi . Then I visit there and I get best treatment wrinkle reduction. Now I am very happy with this treatment and thanks for klinikesthetika clinic.